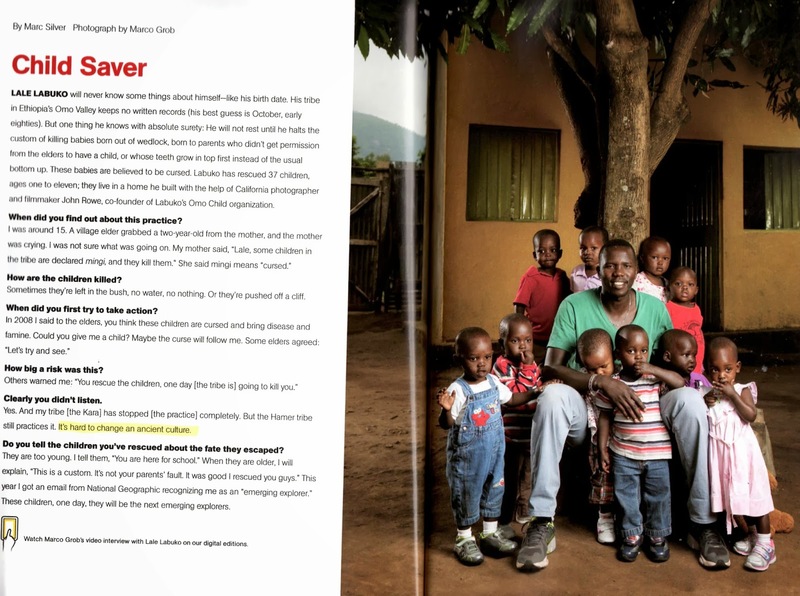 Mark Silver’s article in the December 2013 issue of National Geographic heralds this Special Christmas Edition of a Hero of the Environment – Lale Labuko. Mr. Labuko is an Ethiopian who was disturbed by the environmental littering by his tribe. It is an ancient cultural practice for the tribe to cast into the landscape to die of exposure, infants and young children who have teeth that grew top first (rather than more common bottom first), or were born out of wedlock, or born to parents who didn’t have permission from the elders. The grisly deaths of these innocents over the centuries spared the tribe from disease and famine. Culture is shared beliefs. When a belief is irrational it is destructive (if witnessed by a rational observer.) To the irrational believer, the belief is totally rational and any destruction or unwanted results have to be caused by something else. In this situation, the tribe’s history ascribes famine and disease as punishment from (god or gods not mentioned in the article) some supernatural force for allowing unclean children to thrive. Kill the unclean children, and the (unmentioned supernatural forces) are appeased and the tribe prospers. For at least 37 little boys and girls, Lale Labuko’s rational belief has brought at least an interruption of ancient custom and, perhaps, shining a small light onto more appropriate 21st century understanding of cause and effect. Hero - Lale Labuko with "cursed" children. Not.